Check APTET 2017 exam centre allotment at aptet.apcfss.in: How to Exercise APTET Exam Center Preference? / How to Submit APTET Exam Center Preferences / How to Modify APTET Exam Center Preferences / How to give APTET Exam Center Preferences. How to give /exercise /modify /change APTET Exam Center Preferences. Govt of AP, DSE had given an option for change of APTET Exam Center Preferences. The candidates who have been allotted test centers at Bangalore, Chennai & Hyderabad, beyond their 5 preferences, an Option will be enabled on ...02.2019 after 4.00 pm for exercising revised preference of examination center within AP State. For such candidates the exam will be conducted on 02.03.2019 from 2.30pm to 5.00pm across the State. In all 4,40,518 candidates applied for APTET 2017. As per the clause no13 of the APTET 2017 Notification and Information Bulletin it was informed that the candidates will be allotted exam centre from among the 5 preferences given by them. However, allotment of centres hall be discretion of department. Further, all the candidates also signed declaration in agreement to the discretion of department regarding test centre allotment. - 61,453 candidates applied for Chittoor and Kadapa districts, 3,110 candidates are allotted exam centers in Chennai. - Similarly, out of 42,622 candidates who applied for Anantapur district 9,052 candidates are allotted exam centers in Bangalore. - Further, out of 50,808candidates who applied for Kurnool District, 3,443 candidates are allotted to exam centers in Hyderabad. If any of these 15,605 candidates prefer not to write TET in the current exam center allotted to them outside A.P State, they can exercise revised preference to write TET on 02.03.2019 between 2:30PM-5:00PM at the exam centers located in the following seven districts Chittoor, Kadapa, Anantapur, Kurnool, Nellore, Krishna and Guntur. This option will be made available online on 13.02.2019 afternoon. Hall tickets will be issued to all such candidates as per their revised preference. These candidates can utilise either of the hall tickets to write TET. It may be noted that if any of these candidates writes the APTET in the first allotted centre (outside AP State) such candidate will not be permitted to write APTET again in the revised preferred centre on 02.03.2019. The admit cards for Andhra Pradesh Teacher Eligibility Test 2017 has been released on February 10 at the official websites – cse.ap.gov.in and aptet.apcfss.in. A total of 4,40,518 candidates applied for TET 2019. The exam is scheduled to be held from February .. to March ... However due to limitations with respect to centres, the Commissioner of School Education (exam conducting body), has come out with a solution. In a note, the exam authority has informed the candidates who have been allotted test centres at Bangalore, Chennai and Hyderabad, beyond their 5 preferences, an option will be enabled on February 13 after 4 pm for exercising revised preference of examination centre within Andhra Pradesh. For such candidates the exam will be conducted on March .. from 2.30 pm to 5.00 pm across the state. This arrangement is done as 15,605 (3.5%) candidates could not be accommodated in their preferential districts due to limited exam centres in the district. So while 61,453 candidates applied for Chittoor and Kadapa districts, 3,110 candidates are allotted exam centers in Chennai. Similarly, out of 42,622 candidates who applied for Anantapur district 9,052 candidates are allotted exam centres in Bangalore. Further, out of 50,808 candidates who applied for Kurnool district, 3,443 candidates are allotted to exam centres in Hyderabad. As 15,605 candidates have preferred not to write TET in the current exam centre allotted to them outside the state, they can exercise revised preference to write TET on March 2 at the exam centres located in the following seven districts - Chittoor, Kadapa, Anantapur, Kurnool, Nellore, Krishna and Guntur. 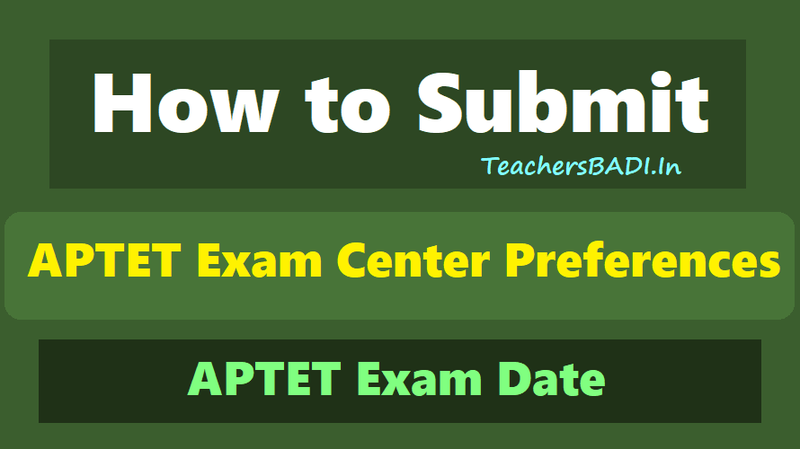 How to Submit APTET Exam Center Preferences? Step 2: Click on the "Submit APTET Exam Center Preferences" link, then a new page will be displayed. Step 3: In this APTET Modify Center Preferance, Enter your ID and Date of Birth in the required fields. 1.To the candidates who have been allotted test centers at Bangalore,Chennai & Hyderabad, beyond their 5 preferences,an option will be enabled on ..02.2019 after 4.00pm for excersing revised preference of examination center within AP State. 2.For such candidates the exam will be conducted on ..03.2019 from 2.30pm to 5.00pm across the State.